Let me kick this post off by saying that I know I am probably the least qualified person to be writing this – I’m not a parent, and I’ll be totally honest and say that, at present, I have no desire to be. I know this might change for me in future and if it does then that’s okay, but for now I think I’m far happier with the idea of getting to be the family friend that buys all the noisy, messy toys at Christmas. But anyway, I digress. Never, ever underestimate what your child can and might be able to do one day, because, I promise you they will defy expectations every single day. It might not be yours that they defy every day, but they will astound someone somewhere at least once a day. I know it’s hard – this part is still hard for me too – but if someone comes up to you in the street and tells you “aw, isn’t your child doing well,” please try and take this as a compliment rather than as them saying this because they don’t know what else to say. They’re most probably saying it because they mean it and they applaud the efforts that you and your child are putting in to be able to do whatever it is that they are doing well. Believe me there’ll be enough people waiting to criticise you, or tell you what they think you should be doing, so please take the compliments of others as a victory whenever they come around. I am always the first person to stand up and say that I would not be where I am today if it was not for the unconditional love and support of my mum and dad. Where others have doubted me or written me off on occasion, they haven’t. And I love them for it. They helped me so much and they know that. They remember all the things they did to help me that I’m too young to recall. I’m old enough now understand just how much that means to me on a personal level, and I’m not sure my folks will ever be able to comprehend even if I try to explain it. They are the ones that helped me discover my fighting streak and lit the fire in my belly that means I want to keep pushing and never give up. I want to keep fighting their good fight, and it’s because they fought so hard in the first place that makes me want to continue. You are not alone. You do not have to go through this alone. There will be people out there who want to try and understand. Your family, friends, medical professionals. They will want to join you and help you and your child. It can be easy to feel like you’re alone, but these people are out there somewhere. You just have to work out who they are and let them in. Please let them in. Please don’t ever feel guilty about wanting a little me time now and then to rest and recharge. The first time I remember my mum going away for a weekend with some of her friends, my dad and I had a wonderful time. He made sure that I had so much fun and tried to keep my mind off missing my mum as much as he could. He took my for my first ever cinema trip, it was to see Disney’s Pocahontas, and we put up the Christmas decorations as a surprise for my mum when she got home. When I was younger I used to think that I couldn’t be sad about the things that I couldn’t do because that was just something I had to accept about my CP. I used to think I wasn’t allowed to be sad that I couldn’t go ice skating with my friends or climb trees, but as I got a bit older I realised it was okay to be sad sometimes, it was okay to cry sometimes, as long as I turned that into motivation to keep going and try to learn to do more things. I’ve said over and over again that I consider myself to be lucky, and I know that I am. I don’t hate my disability; in fact I think it’s had a positive impact on my life in a lot of ways. I still get frustrated sometimes when something doesn’t come easily, and then I often feel like I’ve let myself down for feeling that way. But, I’m only human so I know that this is okay. I just use these emotions as drive to keep going when I feel like it’s all getting a bit much. What a wonderfully uplifting article. The human spirit thrives! This is so great. Your parents are lucky, too. Thank you 🙂 And thank you for reblogging my post. 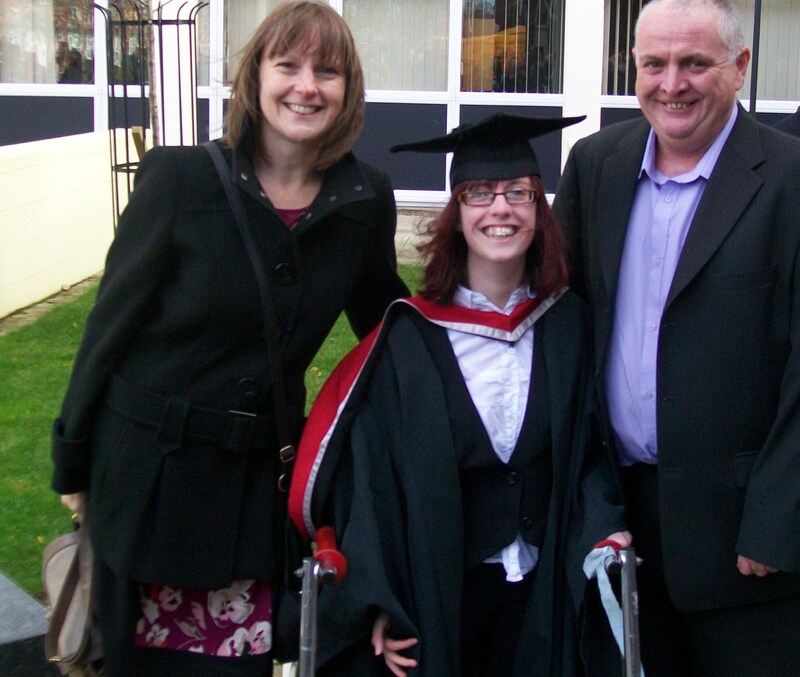 I was so moved by Nic’s wonderful advice to parents of children with cerebral palsy. I think much of it could apply to parents of autistic children. I hope you will enjoy it as much as I did. Then a friends little one was diagnosed with cp and we just got chatting about all sorts of things cp, and now she says I always give great advice and insight into it. The sort the professionals never can, as they don’t live with it, and can only give advice from a medical point of view and not that of a person that lives with it day in day out, and has come up with ways to get around things, and generally knows first hand what it’s like to have cp. I know it probably sounds silly but when I’m around little kids I always get really worried that I’ll scare them if I fall over or something, and I tend to fall over a lot when I’m nervous cause I tense up. I’m really glad that you could give your friend some knowledge and insight. I’m pretty sure you’ll be a great role model for her little one too. I remember meeting my uncle’s friend when I was quite young. He had CP, wore capllipers and had come up to my uncle’s house on his bike. He obviously spent a lot of time talking to my family, but he also took some time to get down on the floor and play with my toys with me. I think he was the first adult I’d knowingly met with CP and I remember thinking that I wanted to be like him when I grew up. I can understand that…. I do get a little bit nervous when I’m around lots of little kids, because they move too fast!!! Maybe I could be like a role model for her, never thought of it that way…. I’ve met quite a few parents who have children with cp, and I’m always happy to chat about things from my point of view. I remember meeting another friends brother who’s son has cp and they were fascinated by my decorated splints, and they used the idea to help get him to wear his!! I know what you mean! I have to admit your splints do sound awsome. I sometimes get patterned ones but I’ve never customised any myself. That’s probably a good thing though cause I’m not very artistic! Thanks for this post Nic! This was a great post Nicolanoo! Has cheered me up and made me want to get on with things!